Also serving communities of Mondovi. There are 18 Assisted Living Facilities in the Eau Claire area, with 15 in Eau Claire and 3 nearby. The average cost of assisted living in Eau Claire is $4,249 per month. This is higher than the national median of $3,346. Cheaper nearby regions include Chippewa Falls with an average starting cost of $3,687. To help you with your search, browse the 35 reviews below for assisted living facilities in Eau Claire. On average, consumers rate assisted living in Eau Claire 4.4 out of 5 stars. Better rated regions include Stanley with an average rating of 5.0 out of 5 stars. Caring.com has helped 6 families in Eau Claire find high-quality senior care. To speak with one of our Family Advisors about assisted living options and costs in Eau Claire, call (855) 863-8283. Eau Claire is a lively community in northwestern Wisconsin situated along the Chippewa River. As Wisconsin's eighth-largest city, Eau Clair has a senior population of approximately 15 percent. That senior population can choose from 25 assisted living facilities in the greater Eau Claire area. 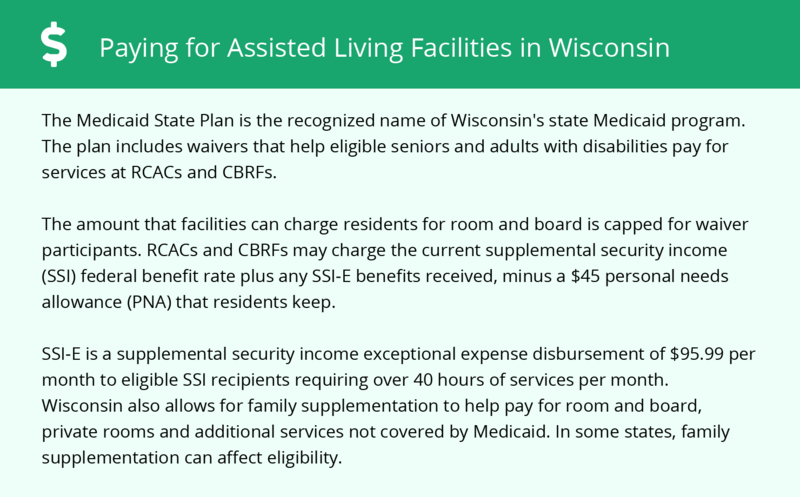 In Eau Claire, as well as the rest of Wisconsin, assisted living facilities (ALF) are defined as facilities that supervise individuals in need of some assistance with daily living activities. The Wisconsin Department of Health Services licenses and regulates the four categories of ALFs throughout Eau Claire. The Eau Claire area is home to world-class medical facilities, including HSHS Sacred Heart Hospital and Marshfield Clinic Hospital, in the event of medical emergencies or illness. The Eau Claire area is serviced by the Eau Claire Transit bus system. Seniors choosing to live in this city qualify for more than half-off regular fare. Eau Claire is considered 19 percent cheaper than Madison, the capital of Wisconsin. Seniors will find groceries, transportation and health costs in Eau Claire less expensive than in Madison. Eau Claire has an array of community resources for seniors, including the Aging and Disability Resource Center, an organization that provides benefits counseling, nutrition services and educational workshops for the aging population, as well as one senior center. Northwestern Wisconsin is known for its varying climate and the four seasons its residents experience. Weather in Eau Claire ranges from an average of 70s in the summer to the teens in the winter. Typically experiencing 47 inches of snow each year, the area receives nearly double the national average snowfall. Seniors with health concerns aggravated by cold climates might look outside of Eau Claire for assisted living. Though eight counties within Wisconsin have received failing grades for air quality, Eau Claire County hasn't experienced any high pollution days for three years. Seniors with respiratory illnesses looking to move to Eau Claire should be aware of the varying pollution levels throughout the state. Assisted Living costs in Eau Claire start around $4,249 per month on average, while the nationwide average cost of assisted living is $4,000 per month, according to the latest figures from Genworth’s Cost of Care Survey. It’s important to note that assisted living rates in Eau Claire and the surrounding suburbs can vary widely based on factors such as location, the level of care needed, apartment size and the types of amenities offered at each community. 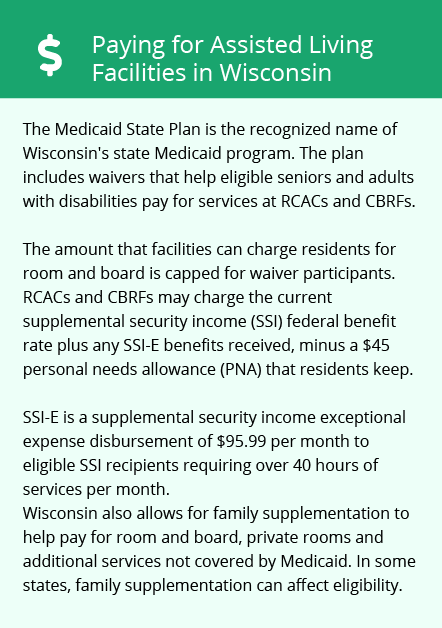 In Eau Claire, Wisconsin's Exceptional Expense Supplement for Members of Supplemental Security Income (SSI) program provides eligible seniors additional Social Security income that can be used to help pay for assisted living. Seniors can also utilize the Medical Assistance Personal Care program when seeking to live in an ALF with fewer than 20 tenants. To see a list of free assisted living resources in Eau Claire, please visit our Assisted Living in Wisconsin page. Eau Claire-area assisted living communities must adhere to the comprehensive set of state laws and regulations that all assisted living communities in Wisconsin are required to follow. Visit our Assisted Living in Wisconsin page for more information about these laws.